To my brother Jon: do you remember the time I went up to CTC with you, (I think it was called CTC then. Cincinnati State maybe?) you were going to college, we were in the cafeteria and I remember “From The Beginning” playing on their jukebox? I don’t remember a whole lot of things, but for some reason I remember that. Ahh, Fanfare For the Common Man, the brilliant piece by Aaron Copland written for the everyday man serving in the war. Absolutely gorgeous music! Okay, here are a few memories that will have you wondering how Miss Sue ever made it out of her teens alive! That evening we were standing outside of the Terrace Hilton when Keith Emerson came out. Three girls can make a mighty unearthly shriek upon such an exciting event. He smiled. Hey, we were pretty cute in the day!! That was the concert with the full orchestra led by Conductor Godfrey Salmon. It was a magnificent spectacle, a total treat for the ears. At their next concert I attended in 1978, we had second row seats. Oh dear! My favorite memory of that show was when we were all standing on our seats dancing and waving along to the music. 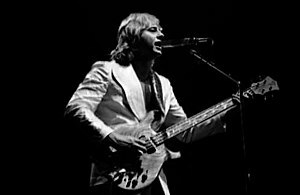 Greg Lake winked at me! You have no idea how completely crazy I was about that man. 🙂 I was so beside myself; I wildly elbowed my friend Sandy and down we three (Marian was the third Musketeer) went like dominoes onto the floor. I’m guessing Greg Lake was probably used to that sight! So, I got my box of DVDs this morning and made sure to get out the two I mentioned the other day: Keen Eddie and ELP’s Beyond the Beginning. My viewing material for sometime over the next 48 hours is ready. 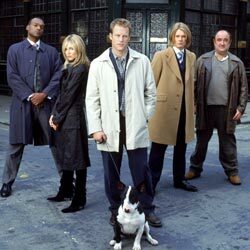 Image via Wikipedia The cast of "Keen Eddie": Best One Season American Show Filmed In London EVER!! Isn’t it the most gorgeous morning? This will give me a chance to upload some photos I took last Fall (Autumn in some parts of the world!) while I was walking on my lunch break around Priceless Hill. Oh, I see some other ones from last Fall worth mentioning as well. There’s Kevin at two different sessions of the Price Hill Library Art Club: one showing a wreath he made, (for the record, he’s shown in front of my workplace, which is next door to the library. This was not a mug shot or an audition for future arrestees!!) and one showing him winning the prize for Best Turkey. Now, I will leave it to you, dear readers, as to the meaning of that! This is a nice chance for a shout out of Price Hill. If you’re from Cincinnati and your only knowledge of Price Hill comes from the news, you could be forgiven for assuming all we know how to do here are conduct gun fights, break ins and all sorts of tomfoolery…. but I’d like to let you know there’s a brilliant monthly art club for budding young artists at the Price Hill Library. One MUST mention Price Hill Chili. My favorite restaurant in Cincinnati and lucky for me it’s at the top of my street! Life can be sweet sometimes. 🙂 There are also so many beautiful homes around Price Hill. I fleetingly thought of doing a photo project last year titled something along the lines of “Price Hill Jewels and Treasures”. I didn’t go anywhere with it, but I have a few houses firmly in mind for photographing. This would be such a satisfying future blog for me. I’m getting ready to purchase a new digital camera and that would be a great first project. Here’s the daffy truth about me: you know how football fans get over that time of the year and NASCAR fans get all giddy at the smell of engine fluid or whatever it is they smell at those races…. that’s how I get when I look at the various camera ads and pick out just the one I want. So, look for a future post showing my new photo efforts. 🙂 For now, here’s a fond gaze at 2010 in Lovely Price Hill. I just got an update of the person I blogged about in my last post. They’re finally off of the respirator and breathing on their own. I’ll be going over to visit this weekend. It’s taken them quite awhile to reach this point. I’m not sure what I’ll say or do, but God has a way of taking care of those small details for me, when I let Him. Celtic Fest is this weekend. They’ve moved it to Fountain Square this year. I’m not sure what I think of that. Originally, it was held in Ault Park, which felt like a divine location to me. Celtic music and nothing but nature surrounding me. I hope to give Fountain Square a try today or tomorrow and will let you know what I think. Hasn’t the change in weather been kind of crazy? Cincinnati goes from blazing hot to CHILLY in one fell swoop. Probably not really, and it probably seems that way in all towns, But really, Cincinnati does seem to jump from one to the other without much in between weather. I do love Fall though! My wedding anniversary is tomorrow. 29 years. Crikey, that makes me kind of old!!! My birthday is coming up shortly. I’ve been updating a post periodically about the birthday month experiment of deliberate acts of kindness. That one will appear on September 30th. For now, I’m planning my day out for the 29th. Lunch somewhere. I have some videos I bought for myself a few birthdays ago that I’ve not opened yet. The “Keen Eddie” series. An Emerson, Lake and Palmer video collection …. “Beyond The Beginning”. I may buy a 12 pack of Tab and party on at home that afternoon with the ELP video and an episode of Keen Eddie. 🙂 Little Brothers will be down on Fountain Square that day at lunchtime handing out carnations and manning/womanning a booth to promote “International Day of Older Persons” which is October 1st. That would be a lovely deliberate act of kindness to help out with. 🙂 Chinese take out for my birthday is another of those…. come on Hank Williams Jr. fans…..
OH, I must reveal my redneck side just a little. I thought of it while writing about ELP. ELP were my FAVORITE band in my youth. I was such a geek for them. 🙂 WELL, they highlighted the High Voltage Festival in London last year, 2010. My husband had on the Palladium Channel a few weeks ago. You can not even imagine the hyperventilating, quivering, teary eyed MESS I turned into when none other than THAT festival popped up on the screen and my beloved ELP appeared….. Okay, for most humans, this would have been nothing. But for me, think: delirium at warp speed. As they broke into “Fanfare For the Common Man” I turned the volume all the way up on that 52 inch buggy, uh, t.v. and got to be 17 for a few minutes!!!! My animals ran from the room, my child belllowed TURN IT DOWN. Uh…… NOOOOOO! I had the presence of mind to hit “Record” when it started. I NEVER have presence of mind….. I should have played the lottery that day!! !